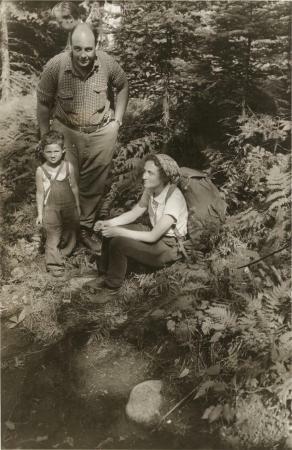 Photograph taken of Wright family stopping for a rest on Mount Marcy trail, climbing in celebration of the 100th anniversary of the first recording assent of Mt. Marcy by Ebenezer Emmons in 1837. Frank Wright was the youngest person to climb Mount Marcy that day. He was four years old.